An article of mine is featured on the prestigious “Okinawa Traditional Karate Liaison Bureau” website. It is about a photo which probably shows the important karate teacher Hanashiro Chōmo at a relatively young age, in the year 1904. Check it out and read the full article. It should be noted that – as usual – there is a certain amount of uncertainty left. However, by placing the article with all sources and explanations online, it allows for a discussion among peers and those interested in this kind of topics. So I hope that in the future more details come to light which either verify or disprove the matter. 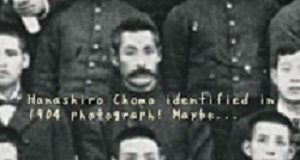 This entry was posted in Misc and tagged Hanashiro Chomo, photo found. Bookmark the permalink.